Our OCC mate Shaun Peck, home port Victoria, Canada, wrote a very-fun Flying Fish article [PDF] on his impressions of crewing on the first leg of our westbound Pacific crossing. We greatly enjoyed Shaun’s contributions to our passage. So it isn’t surprising that we were so pleased to discover Shaun’s passage-report when we opened the 2010-2 edition of Flying Fish here in Hobart. Shaun concluded his dispatch with this perfect sketch. (…) For me the highlights of the voyage were: Steve and Dorothy’s generous hospitality and cuisine; amazing discussions on many subjects; understanding all the many systems on a fully-equipped modern cruising catamaran (compared to my 30-year- old, 42ft ketch); catching a mahi mahi … and one particular night a few days out of Honolulu when I was alone on watch at 0300. It was full moon and I was in shirt sleeves and shorts. Adagio was sailing at 10–12 knots, though surfing down waves up to 17 knots at times. Occasionally I tweaked the trim or wind angle, and all the while I was listening to Dvorak’s Stabat Mater on my iPod! It was a magical experience, not to be forgotten. 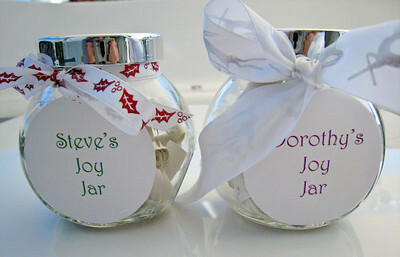 We’ve both overdosed on the joy in our respective jars. The User Guide says “Consume as desired”, so that is what we did. The User Guide also says “No expiry date.” We find that the Joy Jar messages retain their full joy dosage after consumption. This is an empirical observation, based upon consuming Joy written by our daughter and grandkids. Whangamumu Harbour is tucked in behind the Whangamumu Peninsula — some 6nm south of Cape Brett. We are outside the Bay of Islands here, next stop Tahiti if one were to continue sailing ENE from here (as we last did in 2004 enroute Alaska). Whangamumu is an ADAGIO favorite, protected from all but strong NE winds, moderate depths so it is easy to find your spot in 5m of water, roomy so there is space for a lot of boats. When we anchored at mid-day there were two other yachts. By nightfall there were some twenty-odd boats, many of which are summer migrants from Auckland waters on their way to a holiday in the Bay of Islands. 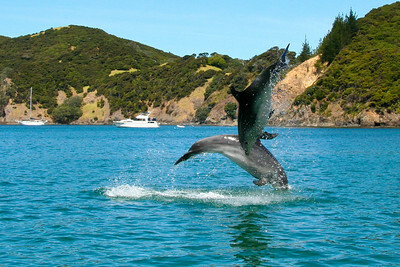 In addition to the attractions of the abandoned whaling station and the gnarly pohutukawa trees surrounding the bay, there is a pod of bottlenose dolphins. While paddling the kayak along the shore Alan and Sarah discovered the dolphins as they were herding a school of fish against the rocks. We observed the fun from ADAGIO for a bit, then for a better photo platform we launched ALLEGRO. The dolphins appeared to be feeding continuously around the shore of the inner bay. The foraging activity sometimes included spectacular jumps, lunges, sprints and nose-stands. Our impression was that the acrobatics of the agile dolphins are triggered by unexpected escape moves by the target school. At one point, they seemed to take a break from fishing to play with a piece of seaweed. Great fun — we enjoyed a couple of hours with the dolphins — as you can see from the photo gallery linked at left. During the evening the dolphins continued to feed, passing within a couple of meters of ADAGIO near sunset. Dorothy and Steve are back in summery New Zealand — five and one-half years and two Pacific crossings since we last sailed out of the Bay of Islands on June 7, 2004 — bound for Tahiti, Hawaii and Alaska. We are kicking up our heels to be sharing anchorages again with dear Bay of Islands friends like Jane and Shelly on MAGIC DRAGON and David and Susan on IMAGINE. So many more friends to catch up with — we’ve just anchored in Pomare Bay in front of our former home on Te Wahapu, hoping to visit with Jeremy and Diana Pope and Matt and Carol Harvey before we shift over to Opua to collect the Weindorf family for our 2009 Christmas adventure. So, what have we been up to this year? We celebrated the 2008 holiday season with our daughter, Kim, son-in-law, Alan, and wonderful grandchildren, David (age 12) and Sarah (age 9). In January we flew to Hobart, Tasmania for their Summer Festival, many visits with friends, the Australia Wooden Boat Festival in Hobart, the Australian TROPFEST film festival, the Folk Music Festival, Ten Days on the Island, and more. March found us back in California for more fun with Kim and her family, including a long weekend in Yosemite National Park and lots of bicycling. ADAGIO needed a new bottom job, and the best place to haul her out for new bottom paint was a boat yard located in the Napa Valley. We enjoyed views of the surrounding vineyards from ADAGIO as she was perched high above the marine railway. We enjoyed some, but too few sails around San Francisco Bay — certainly one of the finest sailing venues on planet Earth. By the end of June ADAGIO was provisioned and ready to sail for Hawaii. Fellow OCC sailor Shaun Peck (Victoria, BC) joined us on the Hawaii passage, so ADAGIO sailed once again under the Golden Gate Bridge on June 30, with our daughter and grandchildren watching us on the Exploratorium webcam. On July 12, we arrived in Oahu, Hawaii, after a comfortable and fun passage. 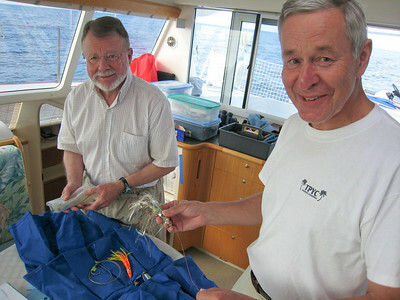 Shaun immediately joined a committee of volunteers in Honolulu to help out with the finish of the 2009 Transpac Race. On July 16, ADAGIO’s population increased again when we were joined by Leo Foley, commodore of the Cruising Yacht Club of Tasmania (Hobart, Tasmania), and fellow OCC sailors Penelope and George Curtis (Oxfordshire, UK). On July 23rd we found the passage weather we wanted to depart for New Caledonia. August 15th, after 23 days at sea, we arrived in New Caledonia. We seem to have partied all the way, with such good company aboard, making for short watches, assistance sailing the boat and help in the galley. We enjoyed showing our crew our favorite places in New Caledonia, even visiting our friends Cleo and Albert in the isle of Pines. We enjoyed cruising New Caledonia through August, then in September we circumnavigated New Caledonia’s “big island”, Grande-Terre. We believe that the best way to see this country is by boat. The coastal areas are very beautiful, and the coastal towns are quite varied, as is the scenery. On October 10, our Australian friends, Ian and Andrew, arrived to join us for the New Zealand passage. We had time to take them sailing, to practice “pulling the strings.” They were an enormous help with the pre-passage preparations, including repairs of a few bits we broke between San Francisco and Newcal. While we waited patiently for NZ passage weather we spent as much time as we could enjoying the beautiful Isle of Pines, including visits with our local friends, and with new cruising friends aboard other boats lucky enough to make it to Ile des Pins. Halloween, October 31, we sailed out of New Caledonia, and arrived in New Zealand on November 6. Head seas were bumpy for the first couple of days, but comfortable after that. 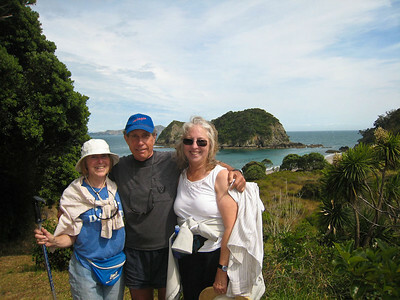 We had a week to show Ian and Andrew around the Bay of Islands, before they returned to Australia. 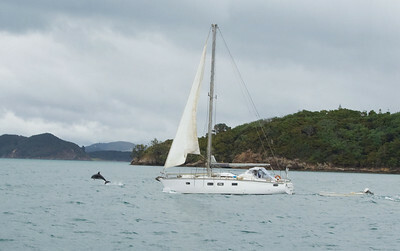 Bay of Islands marine businesses entertained cruisers as they arrived from numerous islands in the South Pacific. We met cruisers from many different countries, and spent social hours getting to know them. As you can tell, we are just a “box of fluffy ducks” being back in enZed, where ADAGIO was launched 9 years ago. We have begun exploring the islands of Urpukapuka, Moturua, Roberton, and the Te Pahi Islands, finding good beaches, coves, caves, hiking trails and fishing spots to show to our grandchildren when they arrive on December 23 for a 10-day visit. Stay well and let us know how you are and where you are — and let us know if you have changed your email address! On December 19th we sailed up to the Te Pahi Islands – our first visit there, thanks to guidance from MAGIC DRAGON and IMAGINE. Lovely anchorages with spots for shelter from most of the BOI winds – you just have to shift your position before the wind shifts. We had a couple of days to catch up, including bits of computer knowhow swapping on echarts and RSS. Then ADAGIO and MAGIC DRAGON set off for Urupukapuka. Steve and Dorothy want to do some more exploration in preparation for the upcoming Christmas visit by Alan, Kim, David and Sarah. Nearing Urupukapuka we slowed so the Dragons could lead us into the best spot to anchor in Otehei Bay. Just then a bottlenose dolphin started playing on the bow wave of MAGIC DRAGON – allowing Dorothy to grab one hasty pic of the dolphin leaping in front of MAGIC DRAGON. On 11 December ADAGIO and David & Susan/IMAGINE sailed to Moturua Island to meet up with MAGIC DRAGON. After a yummy pot-luck aboard ADAGIO (in the rain), we had a good sleep followed by a Saturday morning circuit-tramp around Moturua. We were impressed and pleased with all the improvements that DOC has made to the Moturua tracks and facilities — very first class now, with tracks mowed through the grass wide enough for quad-bikes to service the trails.